1977 Harley Sportster for Sale! See the Pictures! 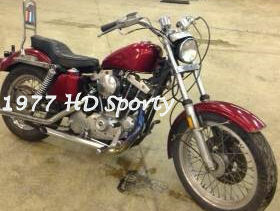 The 1977 Harley Sportster for Sale has been bored to 1150. It has had the heads re-worked and the motorcycle has Andrews cams. PLUS, I just cleaned the carbs and changed the bike's fluids. The heads were re-worked in the last 10,000 miles. This is a good running Sporty with good tires. If you are shopping for a bar hopper or a good vintage bike that will provide solid performance; you've found it. See the Pictures? Isn't it great? If you would like to write a review or voice any opinions on the old Harley for sale, you may use the comments form below this ad to do so. Thanks for visiting GoGoCycles Used Motorcycles for Sale and for taking a look at my 1977 Harley Sportster for Sale. My location is Sioux Falls and in my opinion my asking price of only $2600 (or you are welcome to submit a best offer bid when you call me) is cheap enough that it can't be beat on Craigslist or in an Ebay auction. If you want to take a look or have questions, email me, Jack, and don't forget to mention that you found this ad on GoGoCycles Used Motorcycles for Sale Used Motorcycles and Parts for Sale www.gogocycles.com.